I am running into quite a few doom and gloomers in Orange County lately. And I suppose they have good reason to be down and there is no need to list why. We all know it’s rough right now. One answer is to reach out. Partner up. Get help. One of the goals we are striving for at OCBizBlog is to have a steady increase of expert contribution on small business marketing in Orange County. No one has a monopoly on great ideas and the more minds on OCBizBlog the merrier. So if you are visiting this blog for the first time, contact us with great advice and we will post it. Check out Tornado Marketing’s Adrianne Machina’s post on Building Trust, Small Business Marketing in a Recession Adrianne is an authorized Duct tape Marketing Coach and specializes in marketing software resellers and professional service companies. A few months back, a new ultra lounge opened up in Irvine on MacArthur Blvd near John Wayne Airport, called iLounge. It’s a well-appointed and impressive space run by professional club promoters who are talented and connected. They have developed what seems to be a sustainable vision in a very fickle, tough, competitive market. They’ve really done their homework. Well, most of it anyway. iLounge is the name of the biggest website on the planet for iPod users. iLounge.com gets over 20 million page views a month . It’s a significant brand with a lot of goodwill and sweat equity behind it. And where is it headquartered? San Francisco? New York? LA? Nope. Irvine. The last we heard was that iLounge the club will be promoting themselves as iLounge Orange County. They are launching their website on November 24. This is a blog about small business marketing in Orange County. But I can’t pass up the opportunity to share the Motrin Ad debacle. Johnson & Johnson just pulled this online ad for its over-the-counter pain pill Motrin after it triggered protest on the Internet from consumers who thought the ad was an insensitive portrayal of women’s pain. The ad was launched over the weekend and was geared toward mothers who get back pain from carrying their babies in slings. But angry viewers quickly objected, voicing their opinions quickly and steadily on YouTube and Twitter and numerous blogs and social networks for moms. After they pulled it, J&J issued some lame apology that could have been a real opportunity for conversation with their customers but they whiffed. The power of social media in full effect. Who wouldn’t want to hang out with these guys? This is what a clever point of view (coupled with the ability to execute) can do to a tired worn-out tradition. When it comes to marketing, some folks like tradition. But you’re not some folks. We have been trying to find a solid permission-based email marketing/contact management system for our clients that is affordable and actually works. We have found it with a small business in Phoenix that created a product called Promoterz. For $150 month you can have a complete suite of services that allows you to capture emails of customers and stay in touch with them while also see what they are saying about you. It’s a great product and it works. Oh yeah, and the company is made up of some very cool, competent, trustworthy guys. By Steve Averill|November 17th, 2008|marketing|Comments Off on Who’s Talking About You? 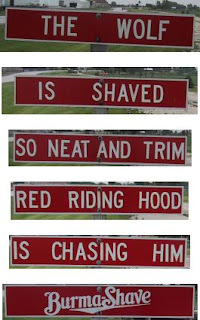 Burma-Shave used to have a campaign where they planted multiple road signs along local highways. The signs were in the form of a short poem that ended with “Burma Shave” as the final sign. They were a big hit back in the day and people enjoyed sharing their latest experience with others, providing nice word of mouth marketing for the Burma-Shave folks. The signs were viewed as entertainment more than advertising and generated some nice goodwill that resulted in steady sales. And now from Lancaster, California, Honda’s marketing team joined forces with the city to turn a stretch of road on the edge of town into a giant LP that plays the William Tell Overture, which you might know as the theme to The Lone Ranger. Pretty cool, though some marketing wonks find it annoying and apparently the folks living near the area were driven mad in a matter of weeks and had the grates removed.